Our selection of pop-up and panel displays provides you with complete creativity in developing a unique tradeshow image. Whether you need your display to be easily portable, customizable, elaborate, cutting-edge, or simple and effective, we have a solution for you. Pop up your full graphic fabric display in seconds - NO channel bars needed! BENX Fab-Wall goes from folded to fabulous in 10 seconds flat. Strong magnetic locks snap the structure into place. All you have to do is pull it up and watch your message burst open. Velcro-on tabs attach the wrinkle-resistant graphic panel to the frame so you can swap graphics in a flash. Xperience - the ease of a pop-up with the look of a custom exhibit! Super easy set-up and take own: the structure unfolds in seconds. xperience can be transported in a shoulder or wheeled bag. xperience offers a variety of graphic options and is available in straight, countertop and large-scale formats. The pictures to the left shows with and without the lights on. Xperience the difference! A creative visual impact in just a few steps. BELLEX offers endless possibilities of configurations thanks to 12 different shapes of frame and the possibility to attach graphics of all sizes on two levels of depth. Combinable. Modular. Use PlentyWall as a backdrop or a room divider. Straight or curved, the quick and easy assembly of this display means less time prepping, more time selling. Display a full graphic panel, a header, or several banners. Its height-adjustable horizontal bar makes it possible. Take any graphic, from fabric to vinyl to inkjet. 8'x 8' Seamless fabric wall panel mounted into an aluminum 1.5” frame and can be replaced easily with a new graphic panel. Not back-lit. The world's most portable back drop packs into a violin case. Weighs just 20 lbs. Single or double sided graphics, easy to store, with telescopic poles for adjustable graphic width and height. Back-lit Fabric Graphics 4’w x 3’h. with LED No Heat lighting sign in lite-weight aluminum frame. 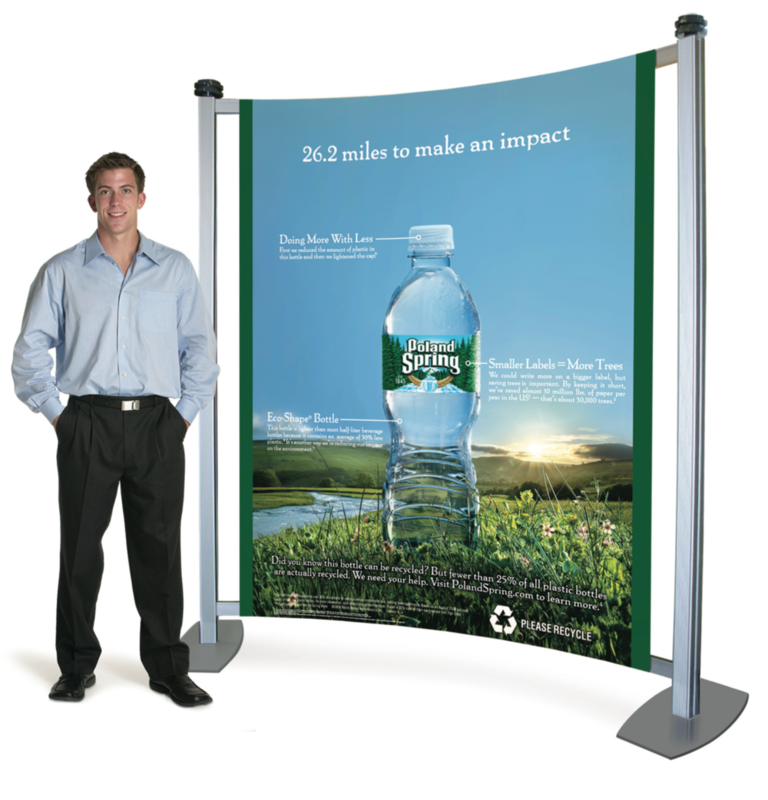 10ft (4 quad x 3 quad) straight pop up display. This tension fabric display sets up in seconds, creating a dynamic appearance that can be used in a wide variety of exhibits and environments. 10ft (4 quad x 3 quad) curved full height tension fabric display provides a versatile display solution. Wheeled storage/shipping bag is included.